Android devices have become very prominent over the last couple of years and represent a useful market sector to target for business applications. Traditional Android development is done in Java using the Eclipse IDE, but this is not the only way to build Android apps. 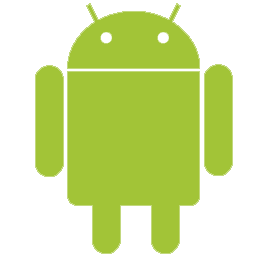 With Oxygene for Java, formerly known as Project "Cooper" from RemObjects, you have all you need to develop and debug applications for deployment to Android phones and tablets. This tutorial looks at getting started with the process of building Android applications with Oxygene, getting to understand the build process and what goes on in an Android application. As well as working with Microsoft’s .NET with Delphi Prism (aka Oxygene for .NET), you can also use the Oxygene language to build applications for the Java platform with Oxygene for Java. This allows you to take your existing Delphi or Oxygene programming skills and immediately make use of them in the Java world, making use of the countless Java libraries and frameworks that exist. It also means you can develop applications for Java and Google's Android. 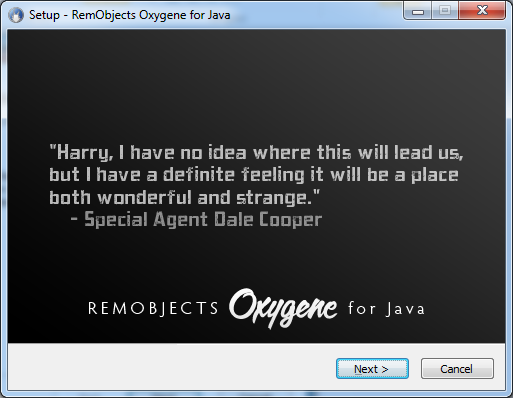 Oxygene for Java is seen by many as a Delphi for Android, at least at the language level. When targeting Android, Oxygene for Java includes the required tooling to build, package, sign, debug and deploy Android applications. Oxygene for Java cuts out the need to learn the Java programming language and the Eclipse IDE, meaning you can retain your Object Pascal programming skills and work in the familiar environment of Visual Studio while still producing native Android apps. Firstly it directly consumes the Java libraries in the Android SDK meaning you can directly access any Android API exactly how you see it documented. Secondly it provides an application template targeting Android devices. Finally it incorporates a toolset that can transform the Java byte code into Dalvik Executable code and package all the required resources for the application before signing the finished application package. Let's take a look at the process of getting set up for developing Android applications with Oxygene for Java on Windows. 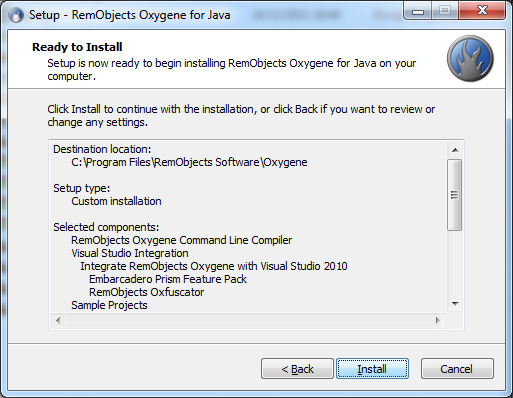 Note: Oxygene for Java requires Visual Studio 2010 or Visual Studio 2012 (official support is present in the August 2012 update of Oxygene for Java). If you do not have a copy of Visual Studio then Oxygene will install the Visual Studio 2012 Shell and work within that. The Android SDK has various dependencies on the Java SE Development Kit (JDK) so this must be installed first. You can download the JDK from Oracle's web site (click the JDK link). Note: The JDK is a superset of the JRE (Java Runtime Environment). The JRE is insufficient; it's the JDK that must be installed. The JDK installer will install the JDK and also the JRE. Note: You must install the 32-bit JDK, even on 64-bit Windows. At the time of writing the current version is JDK 7 Update 2 and the installer is called jdk-7u2-windows-i586.exe (84.04 MB). 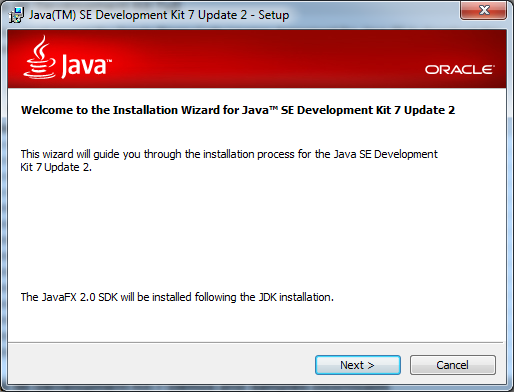 Note: Once JDK 7 has informed you of successful installation, a Continue button then offers to install JavaFX 2.0 SDK. For Android development with Oxygene for Java this is unnecessary and you can close the JavaFX SDK installer without any issues. Note: It is recommended to add the JDK's bin directory to the system PATH (see below for information on how to add to the system PATH). So, for example on 64-bit Windows with the JDK version mentioned above, you'd add C:\Program Files (x86)\Java\jdk1.7.0_02\bin to the PATH, and on 32-bit Windows you'd add C:\Program Files\Java\jdk1.7.0_02\bin. The installation is quite straightforward. This involves a couple of steps. Firstly, download the Android SDK installer from the Android SDK page. Note: the SDK installer is available as a ZIP file to unzip where you choose (currently called android-sdk_r16-windows.zip at 28 MB) or as an installer executable (currently called installer_r16-windows.exe also at 28 MB). It is recommended to use the executable installer, as this puts things in standard locations and also adds registry entries identifying where the SDK is found and adds a Start Menu folder for the Android SDK Tools. If you simply unzip the zipped version, these registry entries will not be present and Oxygene for Java will not be able to locate the SDK, meaning you will have to take extra steps to help it out by setting a dedicated Oxygene for Android option in the Visual Studio IDE (see later). Note: If the installer complains that the JDK cannot be found, just click the installer's Back button followed by the Next button and it should find it on the second attempt. 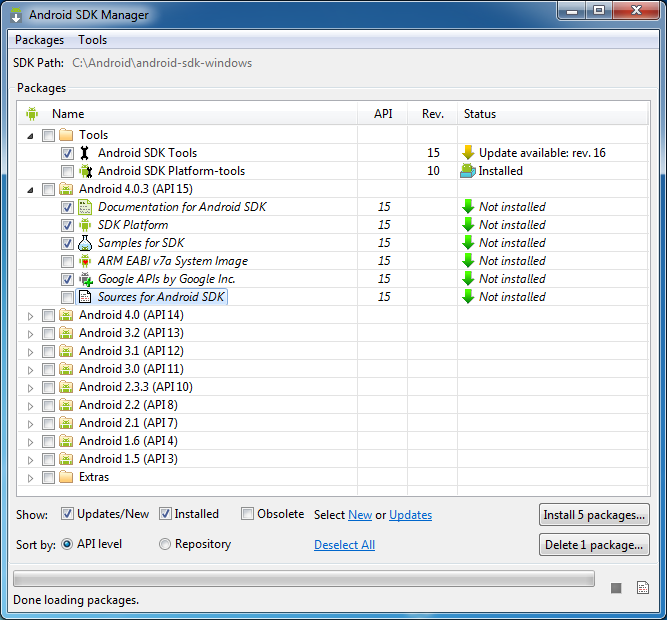 Secondly, to pull down the main parts of the Android SDK, run the SDK Manager. If you used the zipped version of the SDK installer you will need to locate and run the program SDK Manager.exe from wherever you unzipped the files to. By default this will be C:\Program Files\Android\android-sdk-windows\SDK Manager.exe, or C:\Program Files (x86)\Android\android-sdk-windows\SDK Manager.exe if running in 64-bit Windows. Note: if you are running Windows Vista or Windows 7 you should run the SDK Manager as an Administrator (use the menu item on the application shortcut's context menu). This is because the installer defaults to installing the Android SDK materials under C:\Program Files and this is a protected directory in recent versions of Windows. When the SDK Manager starts downloading the required portions of the SDK it will need administrative privileges to avoid simply failing. Alternatively you could change the default installation directory and install elsewhere, for example in a new C:\Android directory. You can now choose parts of the SDK to install. You must install the Android SDK Tools and the Android SDK Platform-tools. In addition you can choose which versions of the Android API to install. Each API version relates to a different release of Android. So, for example, Android 2.2 (API 8) is the FroYo release of Android and Android 2.3.3 (API 10) is the updated (maintenance release) Gingerbread release. You can also choose to install a local copy of the API documentation if you wish. This allows access to the reference materials when not connected to the Internet. Note: the packages available for download by the SDK Manager are regularly updated, and so the revisions shown in the screenshot above may be different to what you see. Additionally, the documentation package available is typically for the latest available API release and so will be found as one of the options for the latest available API release (as in the screenshot above). Note: Once you have an updated tools directory in your Android SDK directory you can also invoke the SDK Manager by launching android.bat, a batch file found in this tools subdirectory. To ensure you can readily run commands at later points you should add a couple of the Android SDK folders onto the system PATH. 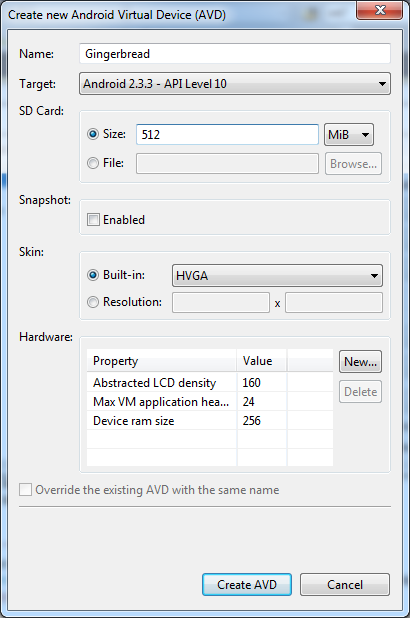 In order to test your applications on various potential device configurations you can set up emulators (Android Virtual Devices or AVDs) for different screen sizes, densities, Android platform and SD card size. Use the New... button to create a new AVD, choose its attributes and give it a name. You can see in the earlier screenshot that the Virtual Devices page tells you these emulator images are stored in %USERPROFILE%\.android\avd - in my case this expands to the C:\Users\Brian Long\.android\avd folder. Note: It should be mentioned again that if you decide to install additional packages after invoking the SDK Manager through the android batch file, you will likely need to have launched it with administrative privileges. You can do so by running the batch file from a command prompt that was run as administrator. An alternative in Windows 7 and (I think also) in Windows Vista is to press ÿ to bring up the Start menu, type in the android command, then press Ctrl+Shift+Enter to run the command as administrator (where just pressing Enter would run as the logged in user).